Hey all, I found a template a few weeks ago to use for a lesson and I have revamped it and made it to suit my current lesson - I Want To Pick Apples, for Grade 5. I've also done this for Grade 6 lesson "Do you Know Anything About...?" see and download for free here. Thanks so much to Waygook User "jchapin45" for original template! Download this PPT Game free by clicking here. You show them the slides, which are first just to read and review. Next, I made an instruction slide as well as a demo slide that uses animations to more aptly explain the game. I have used the Mission Impossible theme for the opening slide music. 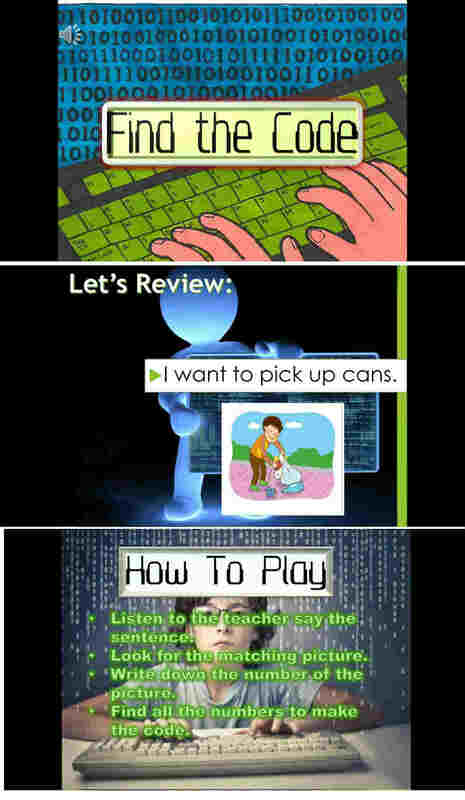 The teacher (you) will have to say sentences that match the pictures on the slides. On the last slide I have written these out for you, just print that last slide out. The students will listen to the sentences you read out and look for the picture that matches each sentence on the screen. There's a number beneath each picture for them to note down. 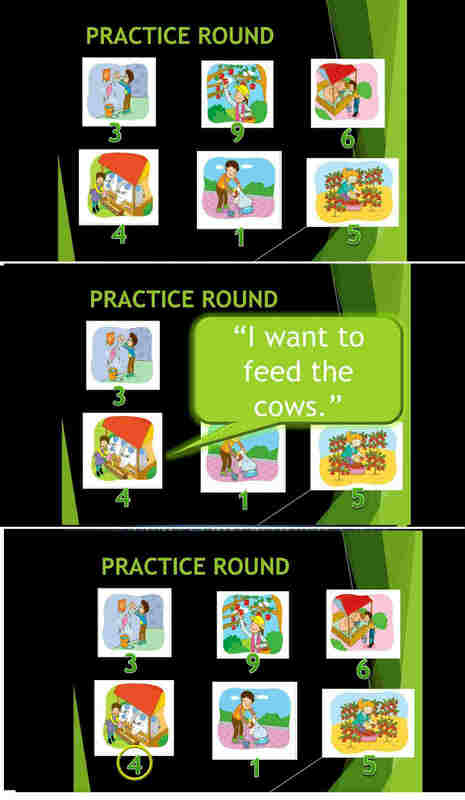 A total of 5 sentences are read aloud and so a total of 5 numbers should be written. - That's the "code". The slide after will reveal these 5 numbers (the code) and the students should check to see if they listened correctly. (Below is the practice slide that only has 4 codes, the rest all have 5). It is a great way to ensure listening in the class room as well as comprehension as they have to look for the correct picture. My students really enjoyed this, it's an easy game to play and adjust. I'd also get a kid to come up and read the sentences one round, makes it more interesting and gives the high level students a chance to challenge themselves even more. Great template, thanks again to waygook poster! I tried to edit the ppt but the actions for the slides aren't working... How do I fix it? it should take you to the thread and when you see Janet1992 (that's me) you can download the original game I modified , which is attached to my comment there. Sorry for the late reply, next time message me on FB too. Hope it works!